WiFi is ubiquitous across organizations. Most IT teams don’t even think about setting up wired networks anymore. WiFi is so much easier and has so many benefits that it isn’t worth spending the time and money on wired networks. The challenge with WiFi, of course, is security. As more organizations move their core network to be WiFi, IT admins are searching for ways to level up their security. One way is to use G Suite credentials for WiFi authentication via a cloud RADIUS implementation. G Suite Credentials and Cloud RADIUS? You might be asking how that works. As most IT admins know, G Suite credentials are fairly locked down and only really work within the G Suite of applications. G Suite directory isn’t a core, authoritative identity provider as much as just a user management system for what was previously known as Google Apps. If G Suite identities can’t be exported, how can they be used for WiFi authentication on-prem? It’s a great question and one that is much broader than thinking about how to just use G Suite creds for WiFi. The question is really how can your users leverage their G Suite identity to be their universal identity across your complete IT infrastructure. In a sense, how can you have True Single Sign-On™ like we had back when Microsoft Active Directory created the concept for a domain. The way to accomplish that is to leverage Directory-as-a-Service®. As a cloud hosted directory service, it is the companion to G Suite. If you think of G Suite much like Exchange and Windows file server, think of Directory-as-a-Service as a replacement for Active Directory. The cloud directory service is the authoritative source of identity. That identity is federated to G Suite, machines (your Windows, MacOS, or Linux laptop or desktop), cloud servers, on-prem and web applications, and, yes, your WiFi authentication via RADIUS. Those same credentials that you leverage with G Suite can also be used across the rest of your IT resources. In a sense, similar to how you would have used Active Directory for your on-prem Windows network. Now, you can do that across cloud and on-prem as well as a variety of platforms. G Suite for WiFi… and Beyond! 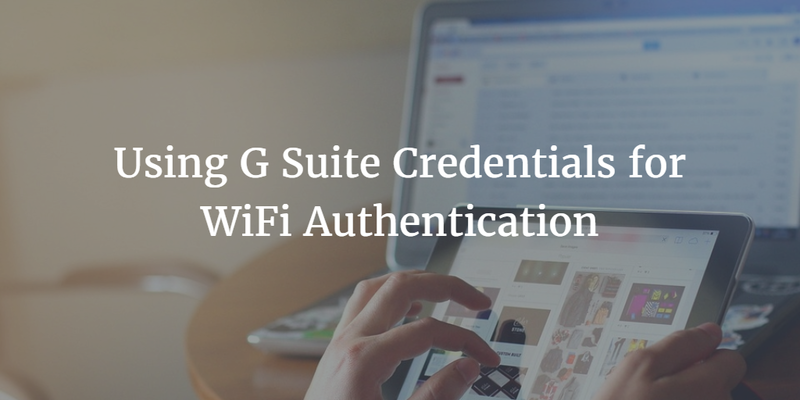 If you would like to learn more about using G Suite credentials for WiFi authentication, drop us a note. We can walk you through how our cloud RADIUS functionality along with our unified cloud directory can help you get there. Or, give our identity management platform a try for yourself. Your first 10 users are free forever.